In our constant quest for great food around Vietnam, we tried Mango Rooms in Hoi An to see if it really was a cut above the rest as touted in reviews. 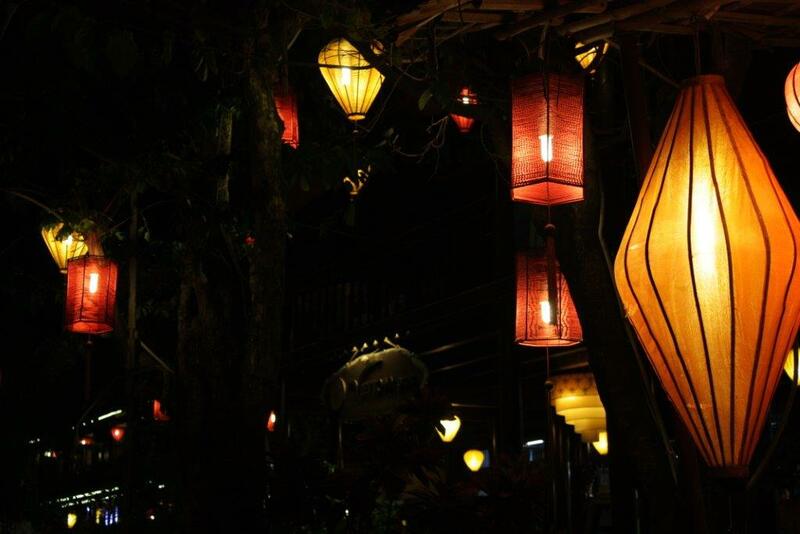 Running between one of the main restaurant streets on one side and overlooking the river on the other, it’s in a prime location to take in the lights and lanterns of a Hoi An evening. Despite the restaurant website claims that chef Duc Tran personally cooks for each and every diner, the night we visited he was working at his other establishment in town (Mango Mango across the river), but whoever was in charge did an excellent job without him. Some really interesting dishes to try that take Vietnamese food to new levels in Hoi An, that fusion stuff, weaving in the chef-owner’s international experience. Beef three ways with vegies was terrific and inventive (eg, chilli stuffed with beef, a snake bean snail-curled with beef), and seared tuna with mango salsa light and delicious. The presentation lets the side down a bit, with fairly large chunks of tomato an watermelon placed on top with little style or finesse. The duck special, cooked with an intriguing chocolate, passionfruit and rosemary sauce, was excellent and perfectly cooked, but for the much higher than average price of around US$25 you’d expect it to be. Seems to be much better value to share a few starters than opt for the higher priced mains. Timing was an issue – as soon as we’d taken the last mouthful of starters, the plates were whisked away and replaced by the main. Savouring meals is not a concept encouraged. The restaurant was very quiet so obviously staff had lots of time to prepare, but that’s not a reason to rush meals. Surprisingly the restaurant set up and decor is pretty much the same as most other Hoi An establishments in the quaint and historic timber riverfront abodes, and it relies on its high standard of innovative food to justify its prices which are considerably higher than others about town. While the toilets were clean, they were pretty ordinary and not what I’d expect from a restaurant elsewhere described as ‘funky’. You’d think a quick makeover with some new tiles and porcelain would be in keeping with the fusion theme. For me as a non-beer drinker, it was nice to be able to enjoy a half price cocktail from the extensive cocktail list, instead of two for one beers. The Jungle Jane is recommended. Not the gastronomic feast we were expecting perhaps, but for those serious about Vietnamese food with a twist, bring out your wallet and visit. Still way cheaper than you’d get at home. 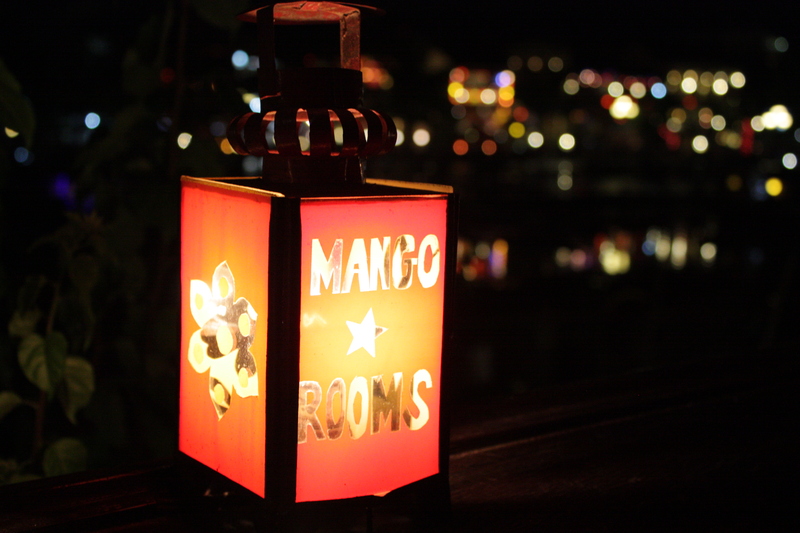 Opt for a balcony seat upstairs to drink in the magic of the lights. 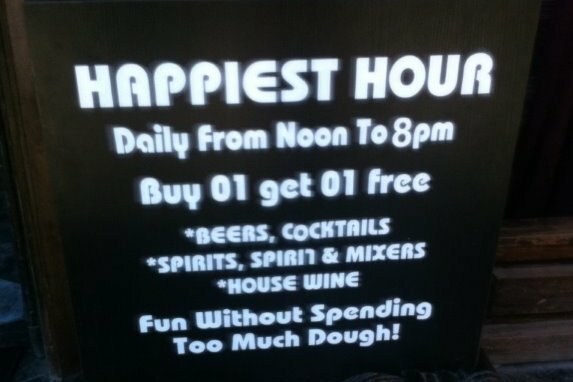 If Mango 1 and its fairyland courtyard wasn’t enough to get us to Mango 2 (Green Mango sister restaurant in Hanoi), the sign outside the fabulous old wooden building advertising ‘the happiest hour’ extending from 12 – 8pm tipped us over. You can eat downstairs or drink around the central bar but we opted to dine solo upstairs on the wooden verandah overlooking the lantern lit street below. We thought we might be forgotten on our lonesome but the waitress was always attentive and appeared whenever she needed to. Wine is an expensive challenge in Vietnam for Mr T and myself (well, me mainly as he can happily opt for cheap and cheery beer). The limited stock of house red had disappeared already but we were allowed to try a couple of glasses of Argentinian malbec as a replacement. As we watched from the verandah, torrents of rain bucketed down around us, causing a quick inward shuffling of the table, but above the rain I was delighted to hear an espresso machine in the background and finished off with a real cappuccino – served hot and beautifully creamed. 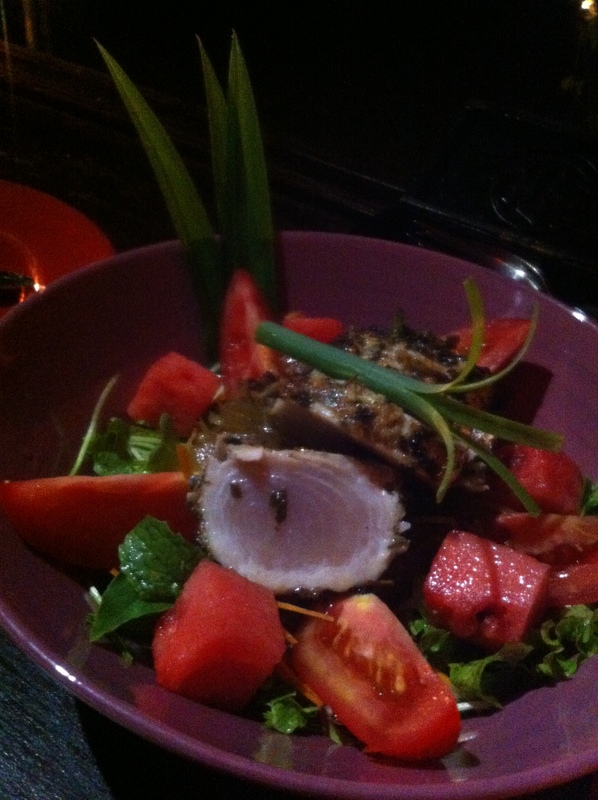 A great fun night – a two hour cooking class then eating the 5-course spoils afterwards. Surprised to discover our instructor was Hai, chef and owner of three Green Mango restaurants in Vietnam, and that we were the only two in the class. Hai was a delight who is clearly passionate about food and his work (you’d have to be to have three), and gave excellent explanations of the technique in each step, information about ingredients and alternatives if some aren’t available in your local area. Picked up some fabulous tips and techniques. We received recipes afterwards by email (useful as the session is pretty full on) although we are finding the instructions difficult to follow in places and not consistent with our memory of cooking. There is, however, the offer to follow up by email with any queries. Completed the evening by sharing food, drinks and stories with Hai – for some hours. There’s a choice of three menus, including a vego option. Our menu included fresh spring rolls with shisho, jicama and mango, pho with beef, banana blossom salad with poached chicken, eggplant vermicelli salad and mango sticky rice. There’s that mango again. You can also include a market trip if you want. Fantastic. Good value and great fun and a highlight of our Hoi An visit. There’s a flood of restaurants doing cooking courses, but this one is serious about the food (as is the restaurant) and passing on technique and knowledge so you can incorporate it into your own cooking. Very pleased when the evening started with a compulsory washing of hands by all participants – hygiene duly noted. If you’re there, give it a go. A couple of weeks in Vietnam has provided lots of opportunities for eating fresh and sometimes fine fare. Seems a pity not to review it really – though the technology delivery didn’t quite coincide with the eating. Herewith some memorable ones. 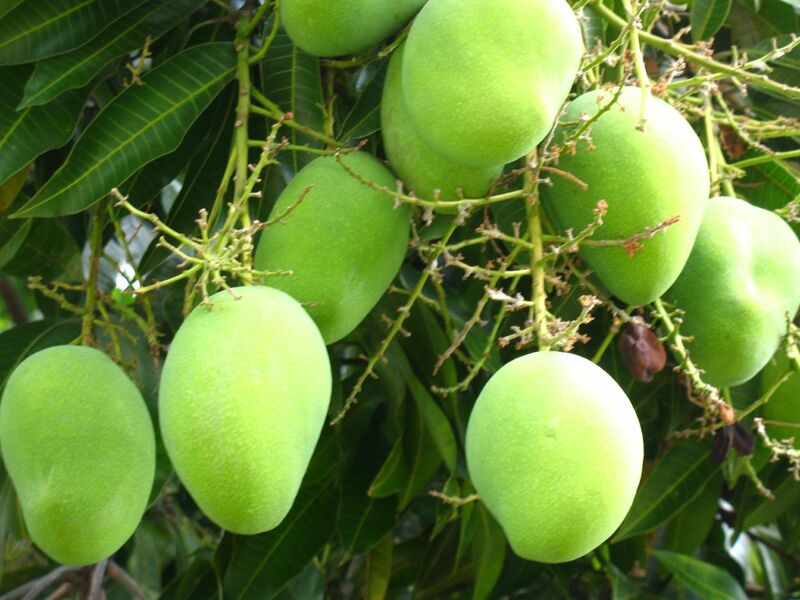 Mangoes, mangoes everywhere, and quite a few to eat. Eating in the Old Quarter can be a bit hit and miss – lots of ordinary places abound, most displaying alarmingly similar menus. On our last night in Hanoi we hit on a gem with a bit of style. We opted to eat ‘outside’ – a beautifully lit and covered courtyard, dripping in lampshades and umbrellas and vertical green gardens, oozing chic and romance if that’s your bent. There’s lot of things you’d expect from a nice restaurant – heavy cutlery, big wine glasses, linen napkins. Food is good too, though we only tried a couple of dishes. Roasted sea bass cooked perfectly and chicken and coconut soup full of flavour, though with a bit of chilli burn, and a refreshing tomato gazpatcho for an unexpected amuse bouche. Strange that the restaurant looks pretty ordinary, even grubby, on the outside of the building on upper levels (also a hotel) as inside it’s immaculate, and quite upmarket. Of course in Hanoi you can eat a lot cheaper, but Mr T and I felt the money was well spent. Avoid the unnamed house red which even at happy hour prices was a bad choice and pretty undrinkable. We sent ours back and moved to better wine by the glass. The friendly manager (Adrian from Cuba) works the floor to say hello and see how you liked the place and didn’t charge for the house wine. Brand new bar area has opened right up the back in mid-October which is sleek and modern with plush lounges, set up for a DJ and with multiple staff in black ‘Save the Cat Ba monkey’ t-shirts milling around anticipating future crowds. We liked it so much, we almost became Green Mango groupies- read on.